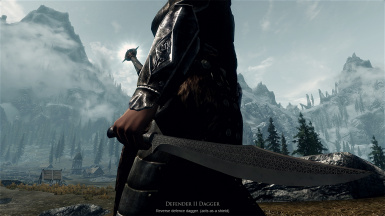 This Skyrim mod installs the DCR Blade Set. 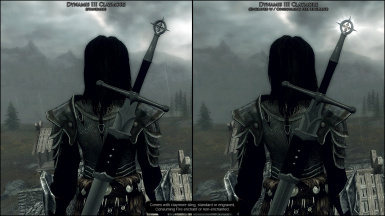 The DCR mods for Skyrim are a continuation of the original Dark Crusader content from Oblivion. Added new - An enchantment glow to the Pommel of the pre-enchanted version of Dynamis III. Added New - Changed the Dawnbreaker spell to Consuming Fire Enchant with new visuals, and behaviors. 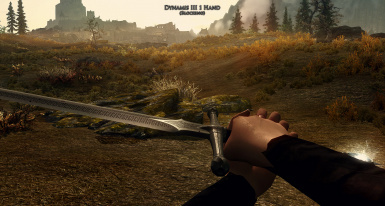 Added New - An offhand defensive dagger that works like a shield. Added New - Engraved 2 hand claymore. Added New - The .esp has been remade, and saved with the Creation Kit. Adjustments - Revamped textures and normal maps. 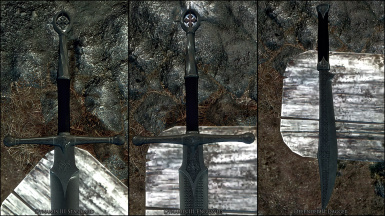 Changed Texture file path from... Data\Textures\DarkCrudsaderReforged to Data\Textures\Weapons\DarkCrusaderReforged. Delete the old texture file path. Added New / Optional - Claymore slings for the standard length two hand swords. -Added New - Claymore sling for Dynamis III Claymore. 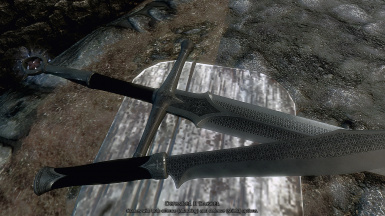 Added New - An engraved version of the swords that match the Defender II Dagger. Added New - A two hand version with a Claymore length blade. Adjustments - Slight material shader adjustments across the board. Adjustments - Slight texture adjustments to the scabbards. Updated: DCR Blade Set Optional Slings are now updated to use the DCRSteel_e.dds cubemap. Added New: Unenchanted 1 Hand, 2 Hand, and Claymore versions with the glowing hilt. Adjustments: The DCR - Blade Set now uses its own cube map. The new cube map has been desaturated, and a slight blue tint was added. Added New: Optional Claymore Slings. -Swords: All three swords come with an option of being engraved or not, and have the option of the Consuming Fire Enchant. 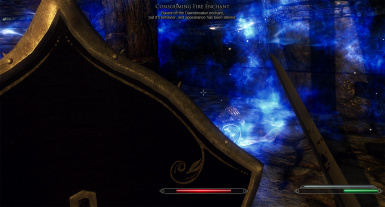 Consuming Fire is a custom enchant for this mod and was based off the Dawnbreaker Enchant. The pre-enchanted versions of these swords have a distinct glow on the hilt. -Daggers: The Defender Daggers come with both an attacking version, or an off-hand defensive version that acts like a shield. 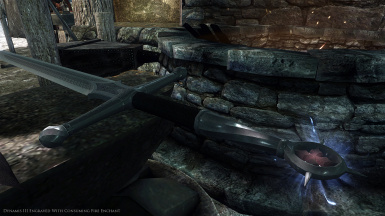 All four weapons are obtained with Ebony level blacksmithing, and are found in the Ebony Blacksmithing Tree. The out-of-box weapons stats are roughly equal to Ebony, Daedric, and the Dawnbreaker weapon(s). 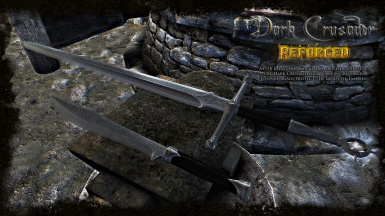 Dark Crusader Reforged is a mod series that recreates everything from the original Oblivion mod, plus items that never made it in. Below is a list in no specific order of items yet to be made. Items in blue are either done, or in beta stages. 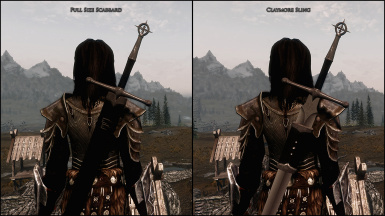 -Adjustments: Item keywords have been fixed for the two hand, and claymore swords. -Adjustments: Added script reference to the DCR Bane Spell. This spell is activated when an undead is killed. The fire damage per-tick has been decreased, but the overall time has been increased (ramp up effect) simulating something catching fire a little closer. 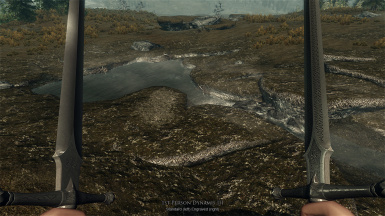 Texture maps and materials for the DCR content is tailored around the use of SKYRIM ENHANCED SHADERS. Although it is not needed, I highly recommend using it to help get the intended appearance.